In the year 2579, the intergalactic weapons corporation, WEAPCO, has dominated the galaxy. Guide Chris Bainfield and his friend Sid Wilson on their quest to liberate the galaxy from the clutches of WEAPCO. Along the way, you will encounter new foes, make new allies, and assist local rebels in strikes against the evil corporation. 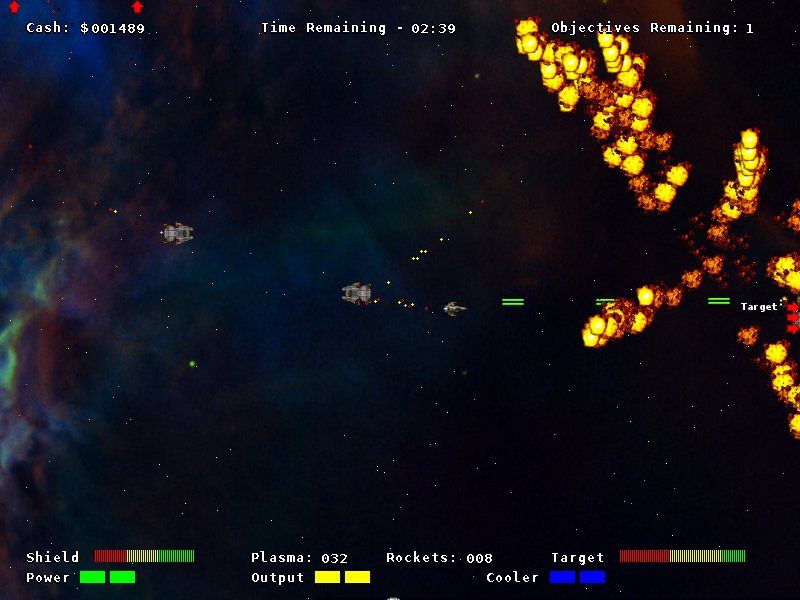 Originally developed by Parallel Realities in 2003, Project: Starfighter is a side-scrolling shoot 'em up space game, released under the GNU GPL. Consisting of 26 engaging levels spanning four planetary systems, this classic game will entertain for hours. Difficulty levels: Choose from several difficulty levels ranging from easy to virtually impossible. Want the original experience? A difficulty level called "Classic" is also available, which imitates the experience of the original Project: Starfighter. Better camera handling: The camera no longer exerts a mysterious force which slows down your movement, and it no longer boxes you into an arbitrary rectangle in autoscrolling levels. Additionally, if you're not moving, it now centers on your ship (except in Classic difficulty). Improved balance: Certain changes have been made to balance the weapons much better (except in Classic difficulty). Most significantly, the overpowered Charge Cannon has been slightly nerfed and made harder to use, making it less of a must-have than it previously was (but still very powerful). Defined character traits:The characters in the original Project: Starfighter were pretty much perpetually sullen and angry. Now, each character has a defined personality which is expressed both in the things they say and in their character portraits. Improved code quality: Several instances of magic numbers and other bad programming practices have been removed, making the code much easier to read. It is also in the process of being made more portable, in particular supporting multiple resolutions. A myriad of bug fixes. Some examples include wrap-around bugs that occurred with ammunition, shop bugs which caused the sale prices of some items to be higher than their buy prices, and bugs which caused cheats to render certain missions unwinnable. Want to see what the game is like? Check out this trailer!